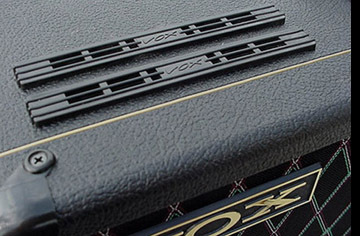 The Vox Royal Guardsman was the second to the top of the line of the US Vox guitar amp models. It was produced from 1966 through 1970 by the Vox division of Thomas Organ, Sepulveda California. Designed to replace the UK produced JMI Vox AC-50 for the US marketplace, the Royal Guardsman featured a vertically oriented 2x12 enclosure on a swivel trolley. 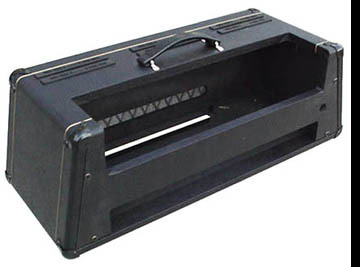 The Royal Guardsman amplifier head featured three channels, reverb, tremolo, and a number of other effects not found in the JMI AC-50. 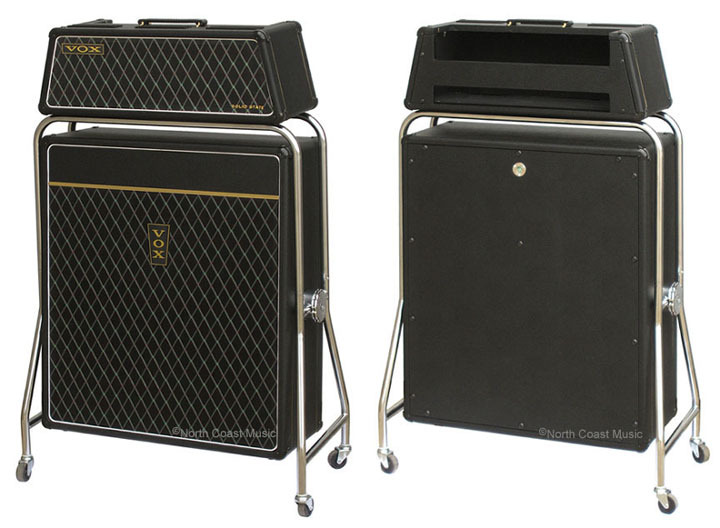 Like the original Royal Guardsman speaker cabinets produced by Thomas Organ, the reissue Vox Royal Guardsman enclosure from North Coast Music features black Vox grill cloth, black levant grain vinyl, eight black plastic one pin corners, a vertical "pie" shaped Vox logo and particle board construction. North Coast Music also recreated the chrome plated tubular steel swivel trolley from the original Royal Guardsman speaker enclosure. 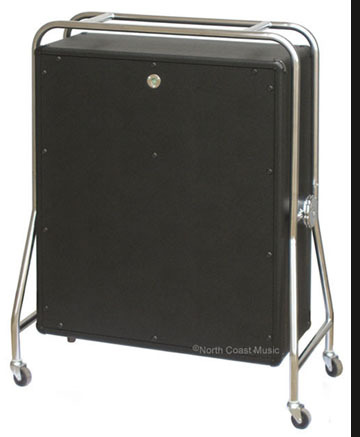 North Coast Music offers the reissue Royal Guardsman speaker cabinet with or without speakers and with or without the swivel trolley. A hole and mounting hardware to install a Goodmans Midax horn is included, although North Coast Music cannot assist you in finding one of these horns. Neither the horn or the crossover network is available from North Coast Music. The trapezoidally shaped Vox Royal Guardsman amp head cabinet by North Coast Music is ready to accept the chassis from any 1960s era Royal Guardsman amp head. You might watch eBay for a Royal Guardsman head that works but isn't in good cosmetic condition. Install the Royal Guardsman electronics from the donor amp into our cabinet and you can own a complete Royal Guardsman amp that has the appearance of just coming out of the showroom. 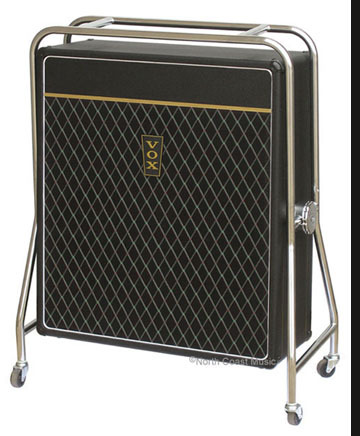 Vox Royal Guardsman Speaker Cabinet, closed back, no speakers, no swivel stand - Speaker cabinet only, no speakers. Finished in Thomas Vox style black vinyl with gold tadpole piping accents and black reissue Vox diamond grill. Includes correct vertical Vox nameplate, eight one pin corners, speaker mounting hardware, and a three pin speaker jack with a 20" long twin lead wire lead. A mounting hole and hardware for the installation of a Goodmans Midax horn is provided. 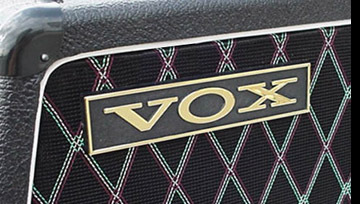 This reissue Royal Guardsman speaker cab is authorized and licensed by Vox UK. Speaker cab dimensions less trolley: 31" tall, 27" wide, 11 1/2" deep. Royal Guardsman Speaker Cabinet, closed back, with two Eminence 8 ohm 30 watt 12" speakers, no swivel stand - As NCM-234 above, but with two 12" Eminence 8 ohm, 30 watt speakers installed and wired in parallel to 4 ohms. This reissue Royal Guardsman cab is authorized and licensed by Vox UK. Vox Royal Guardsman Speaker Cabinet, closed back, no speakers, with swivel stand - Speaker cabinet with swivel trolley but no speakers. Finished in Thomas Vox style black vinyl with gold tadpole piping accents and black reissue Vox diamond grill. Includes correct vertical Vox nameplate, eight one pin corners, speaker mounting hardware, and a three pin speaker jack with a 20" twin lead wire lead. A mounting hole and hardware for the Goodmans Midax horn is provided, although North Coast Music cannot assist you in locating one of these horns. 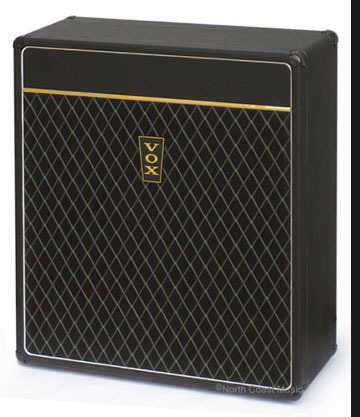 This reissue Royal Guardsman speaker cab is authorized and licensed by Vox UK. Ships by Fed Ex in two cartons, one for the speaker enclosure and a second for the trolley. Requires installation of trolley (takes about five minutes). All holes are predrilled and all fasteners are included. Royal Guardsman Speaker Cabinet, closed back, with swivel stand and two Eminence 8 ohm 30 watt 12" speakers - As NCM234T above, but adds two 12" Eminence 8 ohm, 30 watt speakers to the enclosure, installed and wired in parallel to 4 ohms. Do you have a Beatle/Super Beatle, Royal Guardsman, Buckingham, Westminster, or a Sovereign amp head in a beat up cabinet? This is just the thing to fix those "recover my amp" blues. These amp head cabs, manufactured by North Coast Music, will make your old Thomas amp head look just like brand new. If you add up the current parts costs to replace the vinyl, grill, beadings, nameplates, handles, corners, and vents on your old head cab, you will find that there are almost $270 in parts before you start. For not very much more, you can have a completely new head cabinet. Constructed of 13 ply baltic birch plywood, these new amp head cabs are lightweight and far more durable than their original counterparts. The cabinetry features the same lock joints and dado construction as used by Thomas Organ when they manufactured these cabinets in the 1960s. North Coast Music worked to get all the details right. The amp head cabs feature six plastic injection molded vents made especially for this project that are 100% authentic to the originals. 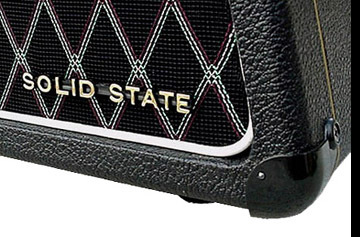 The heads also feature our NCM-030 Vox horizontal nameplate and the "solid state" (our part NCM-112) script with gold plated letters on the front panel. One pin corners are used throughout. A 1/4" 20 tee nut is installed in the inside bottom of the amp head to receive the wing bolt and "head to trolley" security bracket shown below. An NCM-103 "Thomas Vox" handle with brass handle loops is also included. Every mounting hole is predrilled, and every hardware detail has been addressed so that the exchange of the electronics from your old cab to the new cab will be fast and easy. 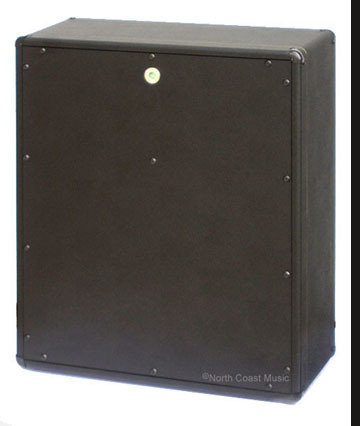 North Coast Music is not providing a replacement head cabinet for the Berkeley series of amps, sorry. Additionally, a Berkeley chassis will not fit into this head enclosure. Outside dimensions: About 27" wide x 10" tall x 10.5" deep including hardware and feet. Inside dimensions: about 24" x 7.5" x 9.5."